CLICK here for high resolution printable trail map (1.2 MB). 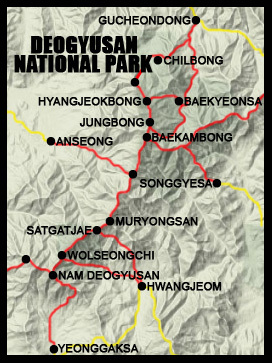 Deogyusan became a national park in 1975 and encompasses an area of 219 km2. The park is located in the center of the peninsula on the border of North Jeolla and South Gyeongsang Provinces and now hosts Muju Ski Resort in the north. Despite Muju being one of Korea's most popular winter resorts, accessing Deogyusan by public transportation continues to be somewhat inconvenient. The mountains are a branch of the Sobaek Range that connects with the Taebaek Mountains further north. Hyangjeokbong (1,1614 m) is the highest peak in the park. Other major peaks include Jungbong (1,594 m), Muryongsan (1,492 m), Satgatbong (1,419 m), and Nam Deogyusan (1,507 m). The ridge runs north-south and declines in elevation in the southern direction. Because it's not the easiest park to reach, foot traffic seems to be less in Deogyusan than in other parks...which is refreshing. Winter hiking is especially fun, but bring your crampons and plenty of warm clothes. Water is also a bit of an issue. Where as Jirisan has freshwater facilities every few kilometers, Deogyusan has only two places to get water on the main ridge, which means you have to carry more with you at any given time. One spring can be found near the Anseong crossroads and another near Satgatjae Shelter. A third spring is located on the trail from Yeonggaksa in the south to Nam Deogyusan. Other than its snow, Deogyusan is best known for its blooming royal azaleas in the spring and day lilies in summertime. There are half a dozen valleys, the most popular at Gucheondong and Anseong, and several waterfalls. Supposedly on clear days hikers can see the peaks of the five surrounding national parks (Songnisan and Gyeryongsan in the north; Gayasan in the east; Naejangsan in the west; and Jirisan in the south). The best time of year for good views is probably mid-winter. A few different animals live in the park, including elk. If you go out early in the morning and get away from everyone else, you just might spot one. For the northern entrance at Samgong Service Complex in Muju, take a train from either Gupo Station or Busan Station to Yeongdong (2 hours 45 minutes). From Yeongdong, take a bus to Muju Terminal (30 min). From Muju Terminal take a bus to Gucheondong (30 min). For an accurate, up-to-date train schedule, check the official KORAIL HOMEPAGE. Once at Yeongdong Station, exit the building and turn right on the street. Walk 5 min down the road. Just before the orange bus stop, buy a ticket for Muju at the convenience store immediately to the right (by the blue bus sign). From the bus stop / parking lot, you can walk up the road to the National Park visitor center, minbak village, campgrounds, and eventually the trailhead. To reach the other entrances to Deogyusan, take an intercity bus from Busan Seobu Terminal to Geochang Bus Terminal. Exit the terminal building, turn left, walk 10 minutes down the road to Geochang Daero (the main street), and take a local bus the rest of the way. From the Samgong Service Complex bus stop / parking lot, take a bus bound for Muju Terminal. At Muju Terminal, transfer to a bus for Yeongdong. At Yeongdong, take the train back to Busan. Regular buses also depart from Muju Terminal for Daejeon, Gwangju, and Daegu. From the Hwangjeom exit take a local bus from the orange bus stop on the opposite side of the road, bound for Geochang (W3,000 / 30 min). Get off on Geochang Daero at the intersection near the bus terminal (it's marked with a sign). Cross the street and walk 10 minutes down the road. The terminal is on the right. Take an intercity bus to Busan (3 hours). Regular buses also depart from Geochang Terminal for Jeonju, Daegu, Seoul, Daejeon, Jinju (7 per day), and Gwangju (5 per day). A full service tourist complex with restaurants, motels (모텔), inns (여권), hotels (호텔), and a few guesthouses (민박) is located at the Samgong entrance. As this is right next to Muju Ski Resort, prices are inflated in the winter. A run-of-the-mill motel will ask for W50,000 for a single room. The only cheap places are a string of grungy minbak on the east side of the village (W30,000 for a small, filthy ondol single). Restaurants are typical of Korean national park villages. The other entrances to the park are small, mostly residential areas with little in the way of lodgings or grub. A massive campground complex (called Deogyudae) is located near Samgong Village at the northern entrance to the park, including hundreds of tent sites and a car camping area. The park service reports that the facilities can accommodate as many as 10,000 people (kind of a scary thought). Cooking areas and restrooms are available. The campgrounds are only open during certain times of the year, so you'll have to call the park service for more details. Both shelters are small and basic. Satgatjae accommodates only about 45 people. You must pack in your own food and bring your own backpacking stove and fuel if you plan to cook. A Thermarest or sleeping pad is definately nice to have. Blankets are available for W1,000. Ear plugs are advisable if you are bothered by snoring. Drinking water is available at Satgatjae, but not at Hyangjeokbong Shelter. While Hyangjeokbong Shelter is on a first-come basic, reservations are required 2 days to 2 weeks in advance for Satgatjae Shelter. The on-line reservation system has recently been updated to accommodate English-speaking foreigners. Simply click on the link below and follow the directions on the page. The park service will confirm your reservation by email within 1-2 days.